With a stellar performance by Sergio Ramos, Real Madrid takes the second position on the table after beating Atletico at the Metropolitano. 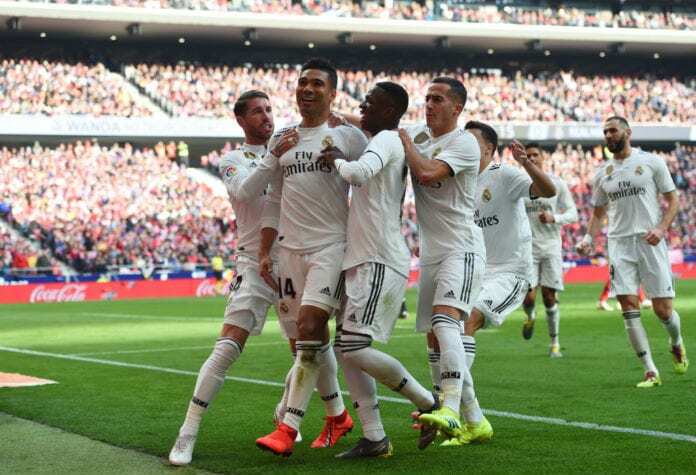 Real Madrid really needed to win this match in order to get back to the second place on La Liga’s table, they were facing Atletico Madrid at the Wanda Metropolitano Stadium in front of a large crowd that was hoping to get a victory. The last time these two squads met at the Santiago Bernabeu in La Liga, things were very different than they are now, manager Santiago Solari has done what nobody thought he could and this Real Madrid squad is finally proving that they don’t need Cristiano Ronaldo to help them win important matches. One of the main factors that have helped the squad get that boost they needed is Vinicius Junior, the young Brazilian who is taking La Liga by storm with his dribbling skills, he had another good performance at the Metropolitano today. The first goal came after a corner-kick for Real Madrid was deflected by the defense in the attempt to prevent Sergio Ramos’s header, the loose ball was perfect for Casemiro to perform an overhead kick and score his side’s first goal of the evening. 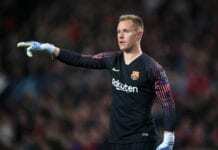 But Atletico responded relatively fast with a counter-attack that Antoine Griezmann finished between Thibaut Courtois’ legs, the match was getting very exciting and we were still enjoying the first half. A controversial call from the referee came after Vinicius Junior was knocked down right outside the box but the referee called a penalty, it was clear that the official made a mistake but VAR did not intervene at any moment. Sergio Ramos took his chance from the spot but he decided to not perform another “Panenka” shot this time against Oblak, he chose well because the goalkeeper remained in the middle thinking it was coming. This 2-1 result remained until the second half, all Atletico Madrid fans were already fuming after that referee’s decision to call a penalty on Vinicius. Real Madrid came back stronger during the second half, Solari made several important substitutions that helped the squad get more presence in midfield and he also gave Gareth Bale another chance to shine for Los Blancos. Vinicius Junior came out of the pitch to give the Welshman his opportunity early in the second half, it took Bale a little less than 20 minutes to make an impression on the game as he managed to score the third goal for his squad and effectively gave Real Madrid the final result. Santiago Solari seems to be taking his time with Gareth Bale’s complete recovery, everything seems to be working fine, as the Welshman came in during the second half and finished a counter-attack that Los Blancos created after the Colchoneros lost the ball in midfield. This final 3-1 result puts things in perspective, it creates massive pressure to FC Barcelona for tomorrow’s match at Athletic Bilbao. 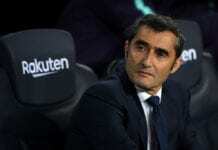 The game that Lionel Messi doesn’t want to miss but he might due to a muscular problem he’s been carrying for a couple of weeks now, Real Madrid is now 5 points behind Barcelona in the table with 45 units. This revival from Los Blancos is complete now, they needed to play important matches like the last two so they could gauge how well they are right now in terms of form and physical condition. Manager Santiago Solari is definitely the man for the job that Zinedine Zidane left vacant, another example of a young manager who knows how the club works and is hungry for success. Los Blancos start a whole new adventure after these two matches, next up they have El Clasico in Copa del Rey at the Santiago Bernabeu. What did you think about Real Madrid’s victory at the Wanda Metropolitano? Please share your opinion in the comment section down below.